All CFMOTO vehicles provide owners with unmatched quality, performance, and value, but who doesn’t love a little something extra? We want you to get the most out of your CFMOTO machine for the best price available. With our CFMOTO current offers, you can get your hands on the latest gear before anyone else. Check out our recent financing options for CFMOTO’s newest models with introductory rates as low as 0%. 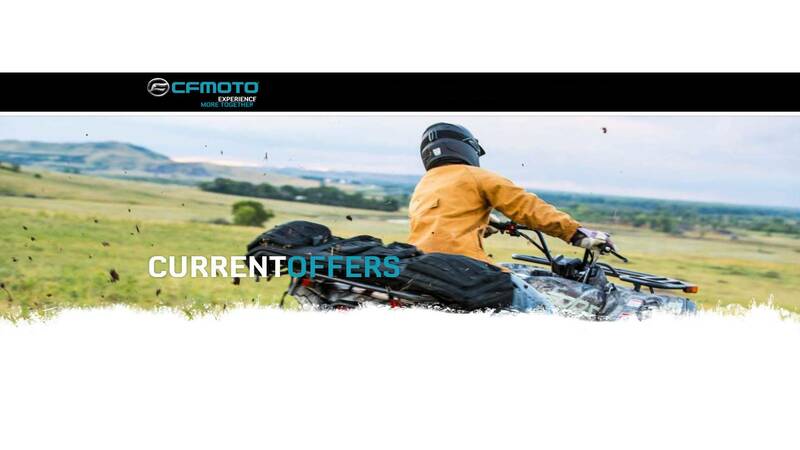 To claim this limited-time financing offer, contact your nearest CFMOTO Dealer. *ATV Maximum Term is 60 months. Maximum Term is 48 months for loan amount below $5,000. Refer to Business Center (www.synchronybusiness.com) for program and operational details, including the Quick Reference Guide and Installment Loan Handbook, or call 1-800-781-7223 for assistance. Monthly payments required. Valid on Amount Financed of $2,500 or more of 2016 and 2019 new unregistered CFMOTO models made between January 09, 2018 and September 30, 2018 on your CFMOTO / Synchrony Financial installment loan account. *An Introductory Rate of 0.00%, and a post-introductory rate of 4.99%, 6.99%, or 8.99% will apply. Example 1: A total 60-month term with an Amount Financed of $5,000: 0.00% rate for the first 6 months and 4.99% rate for remaining 54 months requires monthly payments of $83.34 for the first 6 months, and $93.21 for the remaining 54 months. APR of 4.02%. Example 2: A total 60-month term with an Amount Financed of $5,000: 0.00% rate for the first 6 months and 6.99% rate for remaining 54 months requires monthly payments of $83.34 for the first 6 months, and $97.37 for the remaining 54 months. APR of 5.62%. Example 3: A total 60-month term with an Amount Financed of $5,000: 0.00% rate for the first 6 months and 8.99% rate for remaining 54 months requires monthly payments of $83.34 for the first 6 months, and $101.63 for the remaining 54 months. APR of 7.21%. Program minimum amount financed is $5,000 and 0% - 10% down payment required. Rate and down payment based on credit approval criteria. Offer is subject to credit approval by Synchrony Bank. Monthly payments required. Valid on Amount Financed of $2,500 or more of 2016 through 2019 new unregistered CFMOTO models made between January 09, 2018 and September 30, 2018 on your CFMOTO / Synchrony Financial installment loan account. *Rate of 3.99%, 5.99% or 7.99% will be assigned. Example of monthly payments over a 36-month term at a 3.99% rate: $29.52 per $1,000 financed; and over a 36-month term at a 7.99% rate: $31.33 per $1,000 financed. Program minimum amount financed is $2,500 and 0% - 10% down payment required. Rate and down payment based on credit approval criteria. Offer is subject to credit approval by Synchrony Bank. Monthly payments required. Valid on Amount Financed of $5,000 or more of 2016 through 2019 new unregistered CFMOTO models made between January 09, 2018 and September 30, 2018 on your CFMOTO / Synchrony Financial installment loan account. *Rate of 5.99%, 7.99% or 9.99% will be assigned. Example of monthly payments over a 60-month term at a 5.99% rate: $19.33 per $1,000 financed; and over a 60-month term at a 9.99% rate: $21.24 per $1,000 financed. Program minimum amount financed is $5,000 and 0% - 10% down payment required. Rate and down payment based on credit approval criteria. Monthly payments required. Valid on Amount Financed of $5,000 or more of 2016 through 2018 new unregistered CFMOTO models made between January 09, 2018 and September 30, 2018 on your CFMOTO / Synchrony Financial installment loan account. ATV Maximum term is 60 months. *Rate of 6.49%, 8.49%, or 10.49% will be assigned. Examples of monthly payments over a 72-month term at a 6.49% rate: $16.81 per $1,000 financed; and over a 72-month term at a 9.49% rate: $18.77 per $1,000 financed. Program minimum amount financed is $5,000 and 0% - 10% down payment required. Rate and down payment based on credit approval criteria. Offer is subject to credit approval by Synchrony Bank.